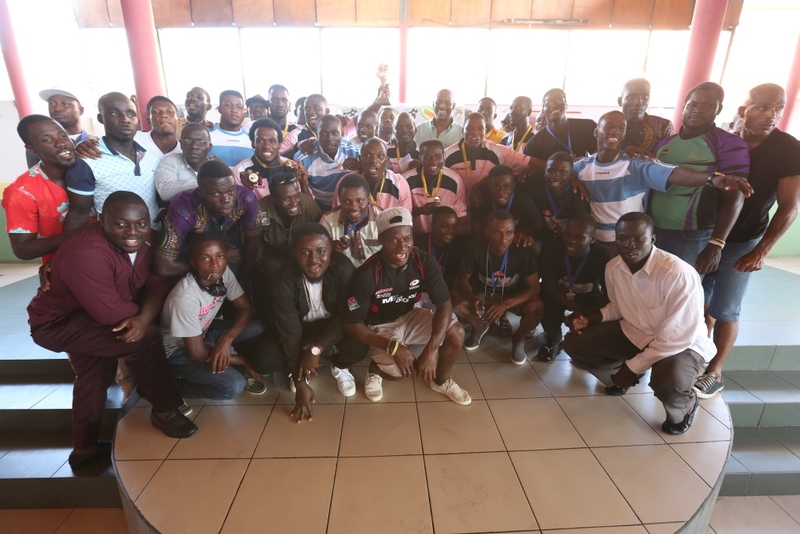 The Ghana Rugby Union Players Association (GRUPA) Sevens Festival was crowned with an official trophy presentation ceremony with the invincible Salim 7 receiving the ultimate prize of a trophy, gold medals, and complete set of jerseys and Ghc1000 for emerging as winners. The ultimate reward was presented to the side by Mr. Herbert Mensah, the President of the Ghana Rugby Football Union (GRFU) at a thrilling ceremony on Sunday September 21, 2015 in Accra. 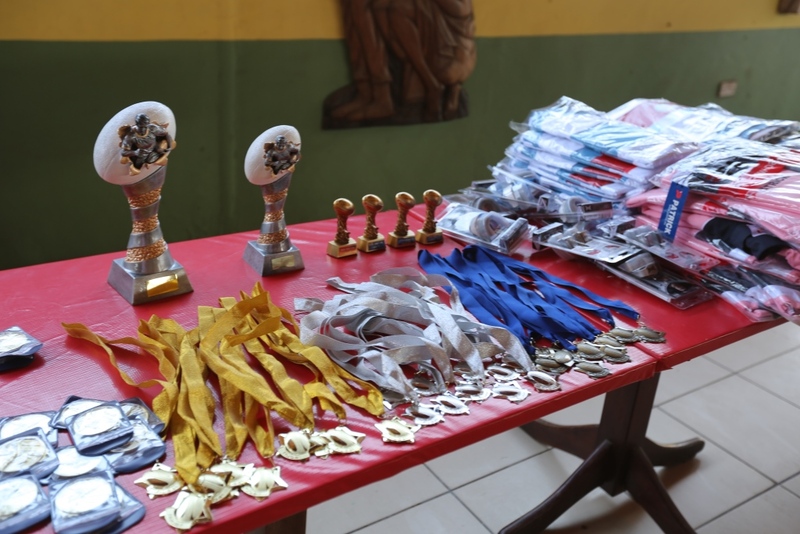 For placing second, Large Star from Titans RFC were also given a trophy, silver medals, a complete set of jersey and GHc 700. Buffaloes, the third place team also received bronze medals and a cash amount of Ghc 500. Salim 7 and Buffaloes were teams drawn from Cosmos Buffaloes RFC who has dominated Ghana Rugby in recent years. The Most Valuable Player (MVP) was picked up by Suwabiru Salim Amuzuloh who had a fantastic tournament scoring two tries to help his team to victory. For organizing an excellent festival, the GRUPA executives who are also rugby players received medals and kits. Mr. Clement Dennis, the Coach for Griffons RFC, was also given a special award in recognition of his zeal and commitment for personally funding his club from Cape Coast to participate in the GRUPA Sevens. 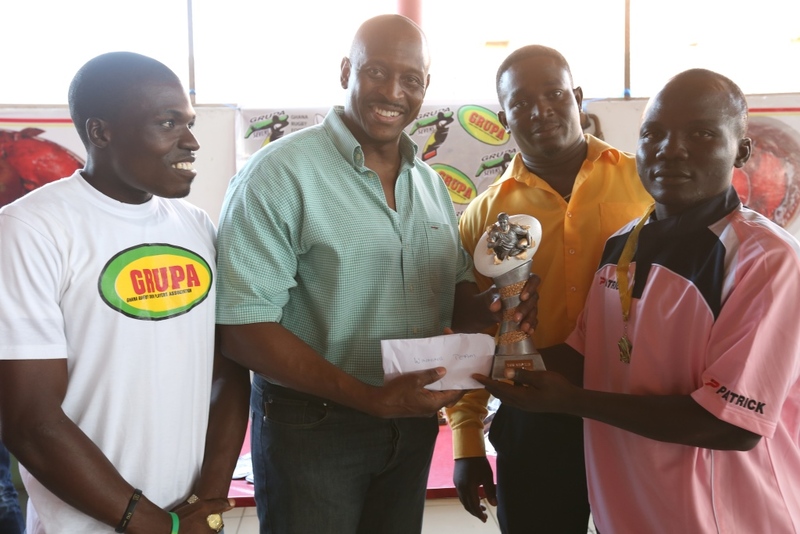 Mr. Dennis was given another accolade as the best referee for the GRUPA Sevens as officials were also honoured. President of GRFU, Mr. Herbert Mensah, who spoke in an exclusive interview praised GRUPA for a well-organized rugby festival which was executed with guidance from GRFU. He believes GRUPA serves as the future of Ghana rugby since the Association has young, enthusiastic and committed individuals who have proven their managerial abilities in rugby. He says the neglect of rugby by sports authorities in the country has required brave people to develop the sports. “Things are changing and I’m happy that we have a player association that is prepared to work with the executives and understands the difficulties of the game. They will soon take up leadership positions to advance Ghana Rugby” Herbert said. Under Mr. Mensah’s leadership, rugby has seen a major transformation. The previous Club Championship was organized professionally and the game has received over 60% investment through personal efforts. This is still inadequate and the executive is branding the game to attract more sponsorship. He is hopeful that, with the right structures, resources and competent people Ghana will be placed on the world Rugby map soon. Suwabiru Salim Amusoloh, the MVP for the tournament who spoke to the press credited his achievement to hard work and dedication. He thanked his team mates and encouraged them to put in an extra effort to help Cosmos achieve more laurels. The Coach of Cosmos Buffaloes FC, Amuzuloh K.A. Salim who guided two teams to first and third places was overjoyed and was proud his son picked up the MVP to put the icing on the cake. Hesitating to disclose his trade secrets he said his players undergo tough training sessions frequently to prepare for competitions. He maintains a high discipline in camp and teamwork forms a key factor in their activities. He disclosed that they have raised their standards to help the team defend their league title in the Ghana Rugby Club Championships (GRCC) which starts in November. Clement Dennis, the Coach for Griffons RFC who is actively using Rugby to help street children and other young people in Cape Coast applauded GRUPA for the tournament. He explained that frequent competitions will keep teams active to compliment the Club Championships. President of GRUPA, Michael Ako Wilson, disclosed that the tournament has raised the morale of all the players under the association and they are eager to compete again in the upcoming Accra Sevens before the commencement of the league. He used the opportunity to thank Mr. Herbert Mensah for his unflinching support. He acknowledged T’Best Fruit Juice and Atlantic Tuna for their support. He appealed for more sponsorship from corporate bodies since funding has been a challenge for Ghana rugby. Vice President of GRUPA, Mr. Marshall Nortey revealed that the association is implementing plans to cater for the welfare of rugby players in Ghana. He also revealed that the Association is liaising with teams in France and other development countries to recruit local players in order to boost the national Ghana Rugby team. “We are putting our players to that pedestal where they can be contacted to go and play in professional leagues outside to gain more exposure and render that experience to the Black Eagles to lift Ghana to play in a higher division in international competitions,” he added.